Congratulations to the newly elected leadership of SNEB and thank you to all of the members nominated for offices. The society is stronger for your commitment to serve. Since the early days of SNEB, there has been support among the membership for the society to take an active role in educating members about nutrition policy. The resolutions process is one of the mechanisms for members, or groups of members, to bring forth policy positions for discussion and vote by the membership. The resolution must be submitted by email and/or fax (electronic copy strongly encouraged) to the SNEB office by April 15. Note: This webinar has been approved for learning code 1050 — Ethics. This webinar will help student members of SNEB learn about what the society has to offer and how to become involved at various levels. Fall 2015 marks the sixth semester that SNEB will host the JNEB Journal Club series of webinars. 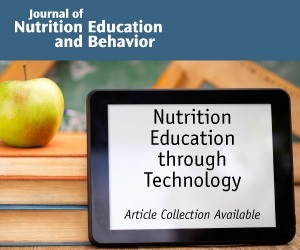 Based on member interest and the success of this spring's statistical methodology series, the fall series will focus on Survey Design and Validation in Nutrition Education and Behavior Research. The webinars will feature JNEB authors sharing their experiences with designing surveys in various formats and validating survey instruments for a variety of audiences. These one-hour webinars, conducted at 1 p.m. EDT on Mondays, will provide valuable learning opportunities for anyone wishing to expand their knowledge of creating and validating surveys. Participants also earn CPE by attending. Remember that SNEB members attend webinars free as a benefit of membership and can access recorded sessions free at any time. Watch for more details on the specific survey topics to be covered. If you would like to be registered for the entire fall webinar series, email rdaeger@sneb.org. Presented by Richard Boles, Ph.D., University of Colorado Denver based on the JNEB article "Differences in Home Food and Activity Environments between Obese and Healthy Weight Families of Preschool Children"
Presented by Martha Archuleta, Ph.D., RD, CD, Utah State University & Dawn VanLeeuwen, Ph.D., New Mexico State University based on the JNEB article "Cooking Schools Improve Nutrient Intake Patterns of People with Type 2 diabetes"
JNEB article collection "Nutrition Education through Technology" now online. Shirley quickly summarizes the New Resource, The Best of Bridge: Home Preserving. For the full written review see the New Resources collection. Tough new controls must be introduced worldwide to stop commercial companies marketing unhealthy foods and drinks which make children overweight and stunt their growth, say some of the world's leading obesity experts. Fruit snacks are everywhere: supermarkets, convenience stores, lunch boxes, cafeterias, vending machines, after-school snacks. But the truth is these brightly colored processed foods have a lot more "snack" than "fruit" in them. If you are looking for healthy snacks for kids or yourself, you will want to stay away from fruit snacks like General Mill's Fruit Roll-Ups, Fruit by the Foot, Fruit Shapes and Gushers or Kellogg's Fruit Flavored Snacks. A new study published in the Journal of the American Geriatrics Society shows that increasing diet soda intake is directly linked to greater abdominal obesity in adults 65 years of age and older. In an article published in The American Journal of Medicine, researchers discuss how existing healthcare delivery models are poorly constructed to manage chronic disease, and how a reengineering of the healthcare system might offer some hope in meeting this challenge. Taking vitamin D supplements could slow or even reverse the progression of less aggressive, or low-grade, prostate tumors without the need for surgery or radiation, a scientist has reported. His team described the approach in one of nearly 11,000 presentations at the 249th National Meeting & Exposition of the American Chemical Society. Researchers at UC San Diego and Creighton University have challenged the intake of vitamin D recommended by the National Academy of Sciences Institute of Medicine, stating that their Recommended Dietary Allowance for vitamin D underestimates the need by a factor of ten. The new documentary film, "Bite Size," follows four inspirational children as they struggle to slim down. Director Corbin Billings talks about America's childhood obesity epidemic and the film's "hopeful" message. According to new analysis of data from the 2009-2012 National Health and Nutrition Examination Survey that evaluated eating patterns of 3,647 children ages 4 to 13 years, skipping lunch is a common practice among children and adolescents, with 13 percent of younger children and 17 percent of 9- to 13-year-olds skipping lunch on a given day. For the 38th year, the Consumer Federation of America will host the Annual National Food Policy Conference April 21-22 in Washington, D.C. This year's conference explores key food policy issues from the perspectives of consumers, the food industry and farmers alike. USDA has announced the availability of up to $5.5 million in Team Nutrition Training Grants for Fiscal Year 2015. These grants are open to State agencies administering the NSLP, School Breakfast Program, the Summer Food Service Program, or CACFP. Through a competitive grants process, Team Nutrition Training Grants will be funded for the period of Sept. 30, 2015 through Sept. 30, 2017. State agencies may apply for up to $350,000. Go here for more information. Newly published research from the Forsyth Institute details a discovery explaining why the 100 million Americans estimated to be taking prescription and over-the-counter antacid and heartburn medications may be at an increased risk of bone fractures. The report, published in the March issue of PLOS Genetics, explains that stomach acid in the gastrointestinal tract plays an important role in helping the intestines absorb and transfer calcium to the skeletal system. Where do Americans usually shop for food and how do they get there? A new survey collected information from a national sample of households about where they shop for food, what they purchase and the prices they pay. It samples SNAP participants as well as nonparticipants in several income levels. It may have become conventional wisdom that you can trick yourself into eating less if you use a smaller plate. But a UConn Health study finds that trick doesn't work for everyone, particularly overweight teens. "It has been assumed that overweight or obese consumers are more likely than others to underestimate the size of a food serving and accordingly overeat — particularly when the food is presented on a large dinner plate or in a large container," says psychiatry professor Lance Bauer. South Carolina Farm to School encourages school districts to apply for funds available through the SC Farm to School Program for use toward farm-to-school initiatives. Thanks to our school breakfast grants, more than 25 million new school breakfasts have been served through December 2014.